Do your best Michael Jordan impersonation with this high flying Slam Dunk Inflatable. 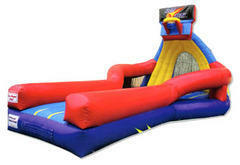 Great for sporting events, school events or carnivals, churches and corporate events. Awesome for teens and adults. This unit requires 35ft x 17ft x 12ft in actual space, power within 50ft of a dedicated electrical outlet free of glass, rocks, sharp objects, dog bombs, tree limbs/branches, gutters, etc.